﻿ Can Ronaldo alone turn things around for Portugal against the USA? 20.06.2014 » Can Ronaldo alone turn things around for Portugal against the USA? As we find ourselves only 48 hours away from the decisive Portugal vs USA match, all sort of problems seem to keep piling up in the Selecção. Only one man's name come to mind when we think about who could turn things around for the Portuguese Team and we're obviously talking about Real Madrid's super star, Cristiano Ronaldo. Nothing is lost yet, but Portugal will have their World Cup's future on the line this Sunday evening, as they step on to the Amazónia Arena in Manaus, in order to lock horns with the USA. After a disappointing performance against Germany last Monday, an entire nation's hopes will be put in one man's shoulders, the Real Madrid super star Cristiano Ronaldo. 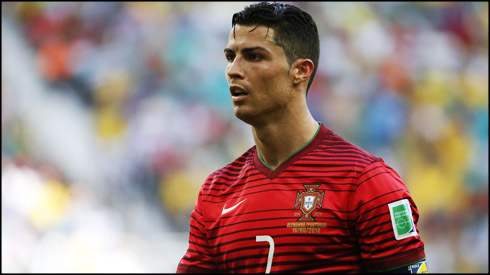 He may not be at the best of his physical condition in this tournament being held in Brazil, but with so many injuries and suspensions' setbacks piling up for Portugal over the last few days, Ronaldo will certainly be his country's last hope to keep their chances alive in the 2014 FIFA World Cup. You can watch Juventus live stream, USA vs Portugal live on ESPN (for those living in the United States) and on BBC One if you're in England. It's already been confirmed by official sources that several Portuguese players will be missing the upcoming game against the USA, starting with Pepe who got handed a 1-game suspension after being shown a straight red card on that 4-0 loss against Germany. Problems at the back go way beyond Pepe's forced absence though and they actually start in the goalkeeper position. Sporting's Rui Patrício picked up a muscular injury on his left thigh last Monday and it will keep him out of competition until at least next week. The more severe injury was picked by Fábio Coentrão though, with the Portuguese Football Federation having already confirmed that he'll be missing the rest of the World Cup, whether or not Portugal makes it through from their group stage. The Real Madrid left-back was, together with Pepe and Ronaldo, one of the most important players in this team, but with him already out of the picture for the rest of the tournament, Paulo Bento must now quickly find a reliable alternative for him. The options on the able are either Benfica's André Almeida or Miguel Veloso, the latter one being the less likely as it obviously would result in an adaptation to the left-back position. The problems for Portugal continue as we move on to more attacking players, as Hugo Almeida will also be unavailable for at least what's left to be played in the group stages. The Portuguese forward has gotten a muscular injury in the front area of his left leg thigh and he won't be able to give his contribute neither against the USA on Sunday, nor Ghana in the final round of the group stage, scheduled for June 26. It's not all bad news though... Cristiano Ronaldo has played the whole 90 minutes against Germany and he's expected to be doing the same against the United States of America on Sunday night. The Portuguese forward has been training with his left knee wrapped up in a bandage, but the Portuguese medical staff have already confirmed that this procedure together with the ice that is often applied on his troublesome knee, are all precautionary measures. Moreover, the Portuguese doctor (José Carlos Noronha) that had allegedly stated to a Spanish newspaper ("El Confidencial") that Ronaldo was putting his career at risk by playing in this World Cup, has recently spoken to the journalists and denied to have ever said that. If there's one player that Portugal can't afford to miss against the USA, that's surely Cristiano Ronaldo. The 29-year old forward has only played in 2 games for Portugal since he joined his teammates on May 29, following a very demanding season for Real Madrid. He still didn't find the back of the net since then and the truth is that he hasn't looked as sharp as he usually does when he's in better form. The problems on his left knee and thigh have been limiting some of his actions on the pitch and only time will tell us if he can still improve his game during this World Cup. Cristiano Ronaldo's next game will be his second World Cup fixture, in a Portugal vs USA game, scheduled for June 22 of 2014, in Manaus (Brazil). You can watch Juventus live stream, Portugal vs USA live stream, Australia vs Spain, Germany vs Ghana, and Argentina vs Iran, all matches provided from our World Cup live streaming game pages.